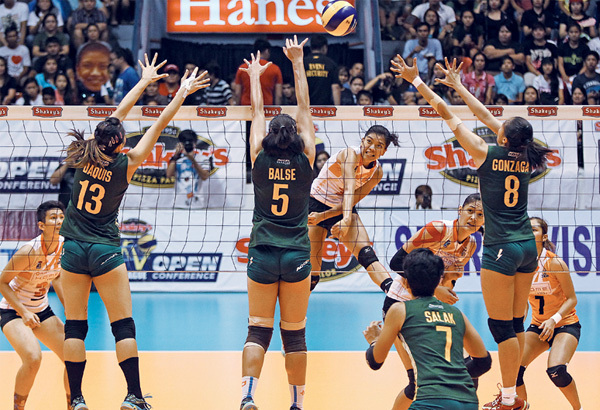 Check out the Shakey's V-League Open Conference championship results, livestream and live updates on this page. CHAMPIONSHIP. PLDT vs. Army Shakey's V-League. MANILA, Philippines - The Philippine Army and PLDT Home Ultera Finals Game 3 battle for the Shakey's V-League Open Conference is set today at 12:45 pm, May 31, 2015 at the San Juan Arena. The defending champion Army and crowd favorite PLDT Home Ultera hope to provide the answers in every serve, every set, every spike and every block that they will dish out in what promises to be a duel to remember. Today, the Shakey’s V-League Open Conference sudden death has generated so much interest not just because of the personnel involved but also because of the protagonists’ brand of play that has caught the fancy of the discerning sporting public. The Lady Troopers took Game One of the best-of-three finals but the Ultra Fast-Spikers tied the series after closing them out in Game Two. Who will get the crown in Game 3? Check out the updates below. PLDT Home ULTERA wins the first set, 25 - 22 but the Philippine Army bounced back in the second, 25-18. Valdez with an attack error. Army takes the third set, 26-24. Valdez sends the game to a decider, 28-26. Crowd throws fans into the court.